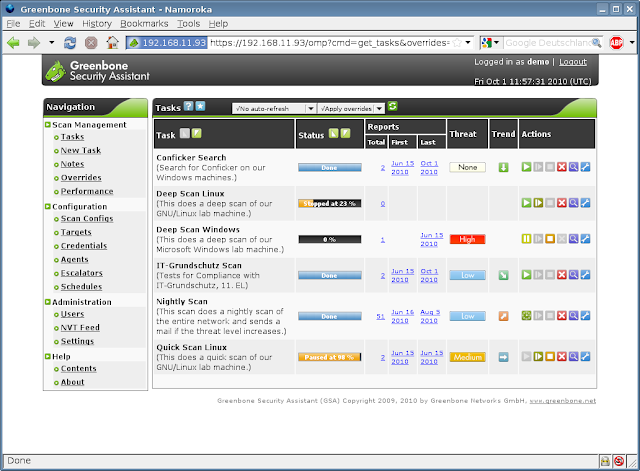 OpenVAS is a framework of several services and tools offering a comprehensive and powerful vulnerability scanning and vulnerability management solution.The powerful and comprehensive OpenVAS solution is available as Free Software and maintained on a daily basis. The reporter reports the vulnerability privately to OpenVAS. The appropriate component's developers works privately with the reporter to resolve the vulnerability. A new release of the OpenVAS component concerned is made that includes the fix. The OpenVAS Manager is the central service that consolidates plain vulnerability scanning into a full vulnerability management solution. 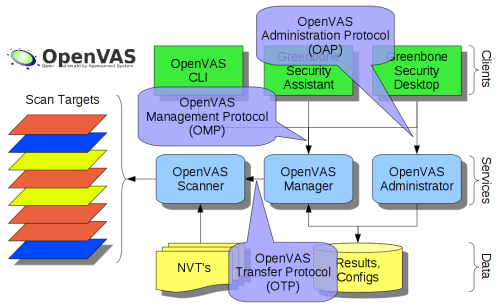 The Manager controls the Scanner via OTP (OpenVAS Transfer Protocol) and itself offers the XML-based, stateless OpenVAS Management Protocol (OMP). All intelligence is implemented in the Manager so that it is possible to implement various lean clients that will behave consistently e.g. with regard to filtering or sorting scan results. The Manager also controls a SQL database (sqlite-based) where all configuration and scan result data is centrally stored.